A cracking fire is one of the great pleasures of camping. Without the right tools though, building and maintaining a fire can get tedious. On a recent winter camping trip with my friend Greg from gadmachine, I realized we used four fire tools that seemed, to me, essential. Some of them I’ve never heard discussed before. The best part is, you can get them all for around $30. Thin, flexible cutting board: Fanning the flames is a fantastic way to get a fire going or revive a dying one. I’ve found no better tool for this than a copy-paper-sized flexible, plastic, cutting board. They’re cheap (about $2.50), light, take up virtually no space, and don’t disintegrate like cardboard. A few good gusts and your fire will roar to life. I always keep one in the camp box. Bow saw: A bow saw will provide you with plenty of free firewood. I use a 30″ saw which gives me a long enough stroke to make quick work of dead standing timber. That size saw is also tall enough to get through a 10″ log in a single cut. Dead, standing, timber is the key here, of course. As long as the wood is off the ground though, it’ll be dry and burn well. You obviously don’t want to cut down live, green trees. I think we spent about $20 on three bundles of firewood for the first night of our trip. 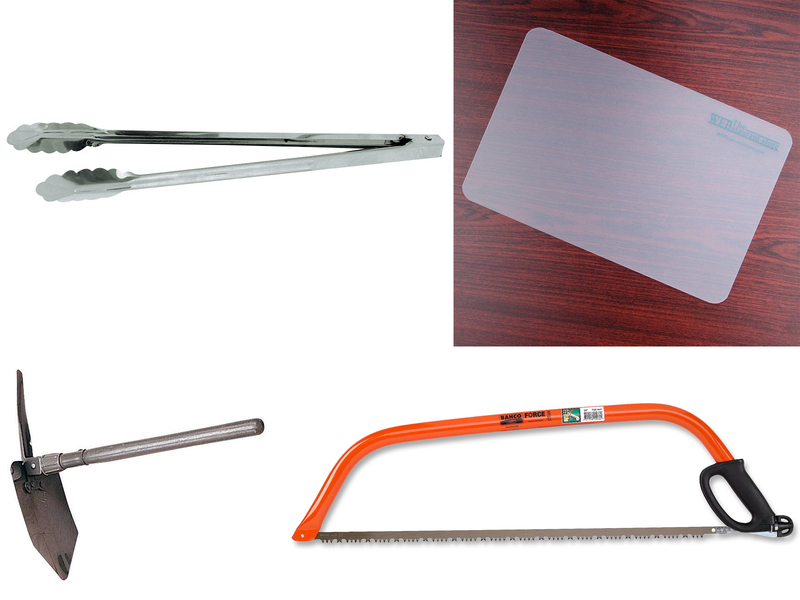 This Bahco saw costs less than $14. Can’t ask for better than that — it pays for itself in one use. Kitchen Tongs: Handy for moving pieces of firewood and coals around. Inexpensive (< $3), light, easy to pack. Around a mellow fire, these 16″ tongs are long enough to keep my fingers from getting burned. And they work for cooking as well. Folding Shovel: Lock the blade to 90˚ to scrape clear an area for your campfire. Use it to pick up the ends of burning logs. Move coals en masse for cooking. And, most importantly, use it for mixing your burned-up coals with water to completely extinguish your fire. And those are only the campfire uses. At just over $10, it’s another inexpensive, high-value item. I always keep a folding shovel in the truck. There you go. Four super-useful campfire for under $30. Natalie found this on Pinterest. 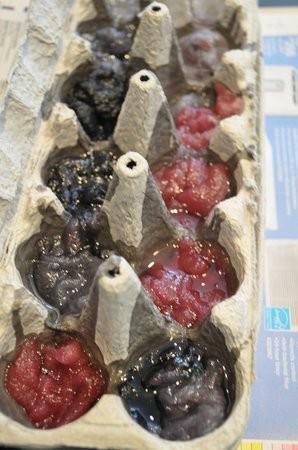 They’re homemade, egg carton fire starters. Fill each cup in the carton with dryer lint and cover with melted wax. When the wax is dry, tear off a cup, place it under the kindling in your campfire-to-be, and light the corner. We’ve been using these the last couple of camp seasons and they work well. We tear off one or two sections of the egg crate, put them into wherever we’re going to light are campfire, and with a single match, the fire is lit. Here’s another great video from iawoodsman on building a split-wood fire. In it, he shows how to precisely split and prep wood into thumb, pencil, and pencil-lead-sized pieces. Another great tip he offers is to prep three times more wood than you’ll need. If you run into trouble while making the fire, you’ll have extra kindling on hand. If you still have extra — great — you’ll have some kindling to start a fire in the morning. The way he presents the skills is so clear. These are very well done. On the subject of campfires, here’s another good one: the long fire. It’s reportedly great for both warming, and cooking if you flatten the logs at one end. In this YouTube video, iawoodsman shows us great set-up and prep for getting the fire going quickly. For example, I like the way he uses two pieces of kindling as a cross brace to support the remaining kindling over the tinder. Here are links to the tools he mentions, the Wetterlings axe, the Trail Blazer folding buck saw, and the UCO storm-proof matches. In another excellent video, below, in which he sets up a firewood cut station, it looks like he’s using the Wetterlings 26″ Forest Axe. These are great videos—very informative. The idea is to take a short, thick log, split it into fourths, set the resulting sections slightly apart, and fill center with tinder and kindling. Once it’s lit, the gaps between the sections facilitate the flow of air and, if the top of the log is flat, you can cook on it. A single log reportedly burns 2—3 hours. The lower video demonstrates an alternative version, if a big log and an axe aren’t available. Both are very clever solutions.